Guys and dolls, raise your cocktail glass if you haven’t seen English singer-writer Adele’s sulky-smooth, Grammy award-winning “Someone Like You” video, and if not, then get thee to a computer. Pack a hanky! Shot in exquisite black and white by the talented director Jake Nava, Adele’s “Someone Like You” video is an epic weepie. Both Adele and the Pont Alexandre III have never looked more drop-dead glamorous. Try watching this moody-bluesy breakup song without crying, singing along, and then hitting repeat. I’ve tried but no can do. In the video, your little eye will spy the Eiffel Tower, the Grand Palais, Les Invalides and the Place de la Concorde. And yes, the La Grande Roue (Ferris Wheel) keeps on rolling! The Pont Alexandre III has always been a favorite backdrop for photo ops. It’s the perfect spot for your social media portraits and status updates, too. Tip! If you want the Eiffel Tower in the shot, photograph it on the bridge’s upstream right bank side of the bridge. Dear Fashion Enthusiasts: Adele’s fetching black A-line coat with asymmetrical gold zipper is from Moschino’s fall 2010 runway line. Bittersweet, they’re no longer available. So what to do? In Montmartre, the Sympa bargin bin shops are now stocking vinyl plaid trench coats for just €5. The Zara chain is also slashing prices. I recently scored a black pea coat with a little A-line action for only €19! Rebounding just got easier (and cheaper!). And Adele’s wild, wild windswept hair? Not a problem, as the damp river air will happily take care of that for you without a fee. Oh, I have been there! 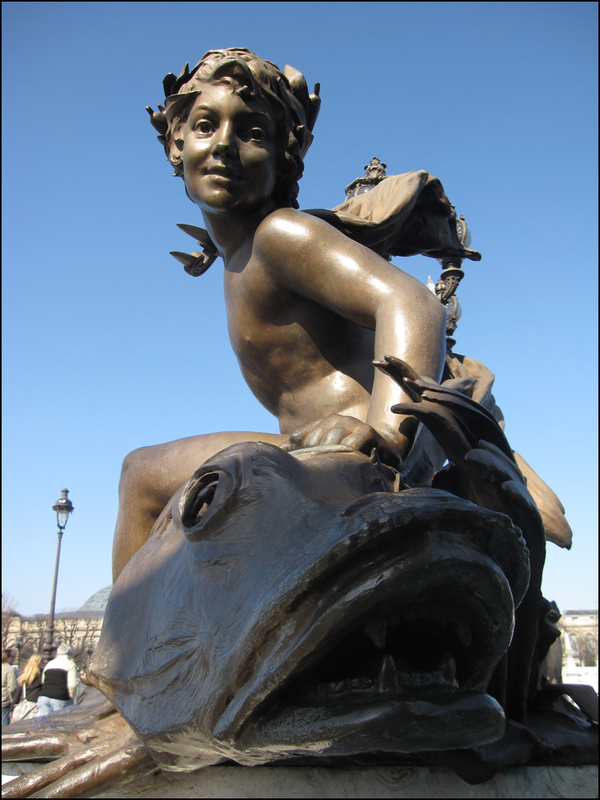 Let’s not forget to mention the brocantes (flea markets) that frequently pop up at the Pont Alexandre III. Timing is key! Trekking to Paris in the near future? 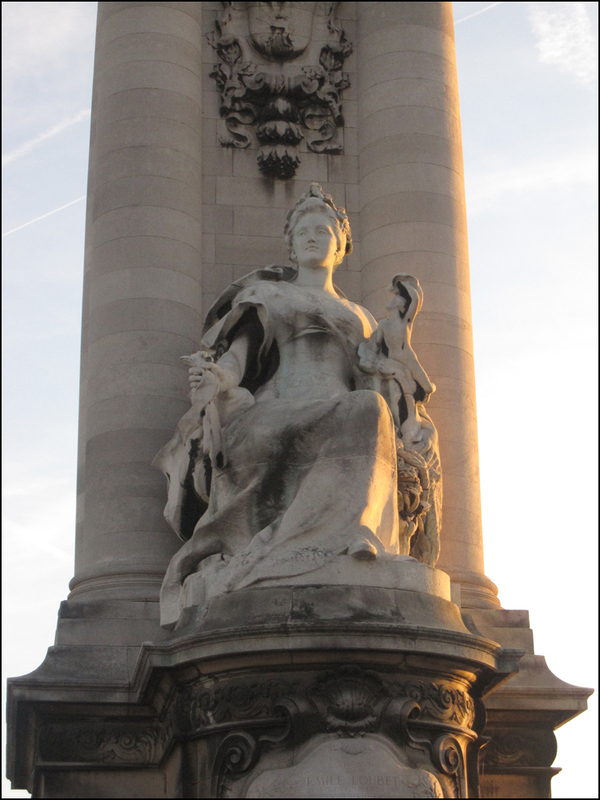 Click here for the 2012 listing of Paris brocantes, vide-greniers and marches aux puces. Happy Hunting! Theodora, your photos are so very magnificant! I have the urge to book a flight to Paris….NOW! You are right on! the pont alexandre iii was always one of my favorite ponts to stroll across. Bravo! I’m a big fan of the Pont neuf, as well! in my view, one of the best picnic spots in paris ~ along with the parcs monceau and buttes chaumont! Seeing Paris through your lens is truly a joy! Looking at these comments reminds me of all the different tavel connected by these blogs…sneaking peeks of others’ cultural immersions. Your posts keep getting richer, more informative! I love that we can not only visit the place, but find the right outfit to go with it and relive the experience. That first image looks like the silhouette of an exhausted backpacker sitting on a rock–who picked up a few too many souvenirs along the way–funny! Lovely pictures, Theadora! 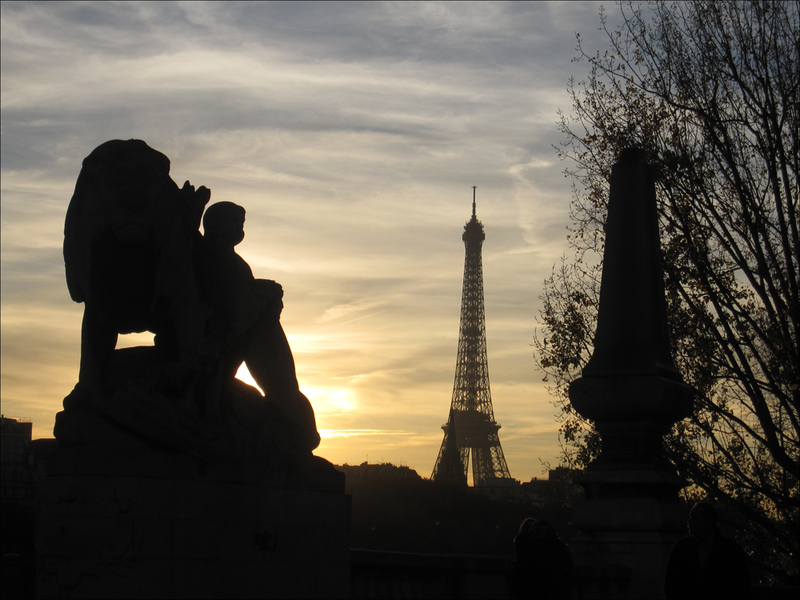 I love the silhouette of the Eiffel Tower and that statue at sunset, simply awesome! For now, it’s actually a wishful thinking, Theodora. The thing is, I can’t even afford to go for a trip outside my country.